Dr. Larry Thompson, Stanford University, and Ann Davidson, former caregiver and author of "Alzheimer's, a Love Story: One Year in My Husband's Journey" and "A Curious Kind of Widow: Loving a Man with Advanced Alzheimer's," co-host this section to explain the importance of pleasant activities in caregivers' daily life to reduce stress levels. 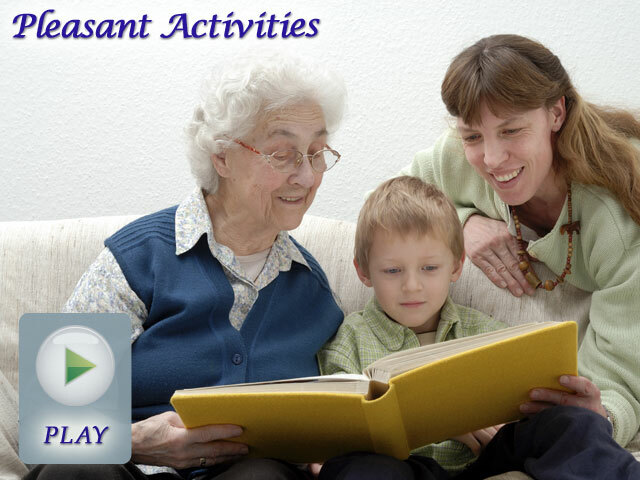 They introduce tips and tools, the "Pleasant Activity Plan" and the "Pleasant Activities Log", for experiencing more pleasant activities. Heather McKay, dementia care specialist, and Teepa Snow, dementia care and education specialist, explain the importance of taking a time-out to be a more effective communicator, a more reliable caregiver, and emotionally available for your loved one. We'll explore how to identify pleasant events, and look at examples of pleasant events. You are encouraged to develop a list of activities that you can do by yourself or with your loved one to find out what you need and what can bring you energy back. This technique will help you maintain the positive mental strength you need when continuing the challenge of being a caregiver for someone with dementia.